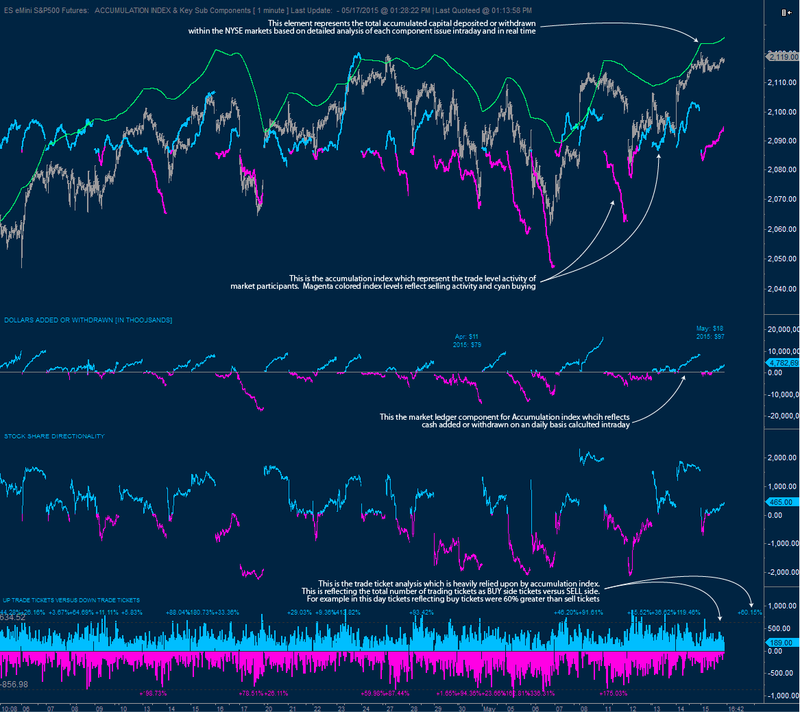 Accumulation, eMotion and Component Indexes represent a significant step forward in terms of visualizing market emotions, internals and flows. This suite of indexes provides a unique view into market activity and a most interesting complement to each other. The capabilities and scope of each are constantly researched and analysed for potential enhancement. For example, the dollar-weighted accumulation index is a new incarnation currently a development and represents a new way to look at quantifying committed institutional market participation versus uncommitted or minority participation. Below, is a brief overview of these tools that will be significantly presented on this site in more detail over time. Accumulation index allows an elegant and detailed view of the trading that is being done based on ticket and trade execution. That allows a significant view into the market participant behavior based on compositing types and quantity of trade executions. When combined with analysis of the component tools like actual dollars added or withdrawn from markets, it is possible to see details underlying the market's character in ways that no other tools can easily provide. For example, it is possible to have a very strong accumulation index occurring into low and dropping prices signaling activity by investor occurring strongly on ask side of the order book and also in high quantity. It is also possible to ascertain how many dollars were net added to (or subtracted from) the markets over a specific period and thus to confirm accumulation index feedback. Also to estimate the actual average sizes of the trade tickets that transacting. That is especially useful in that an abundant amount of small size trade tickets and lack of large size traders can easily point to a lack of institutional participation in the market activity. 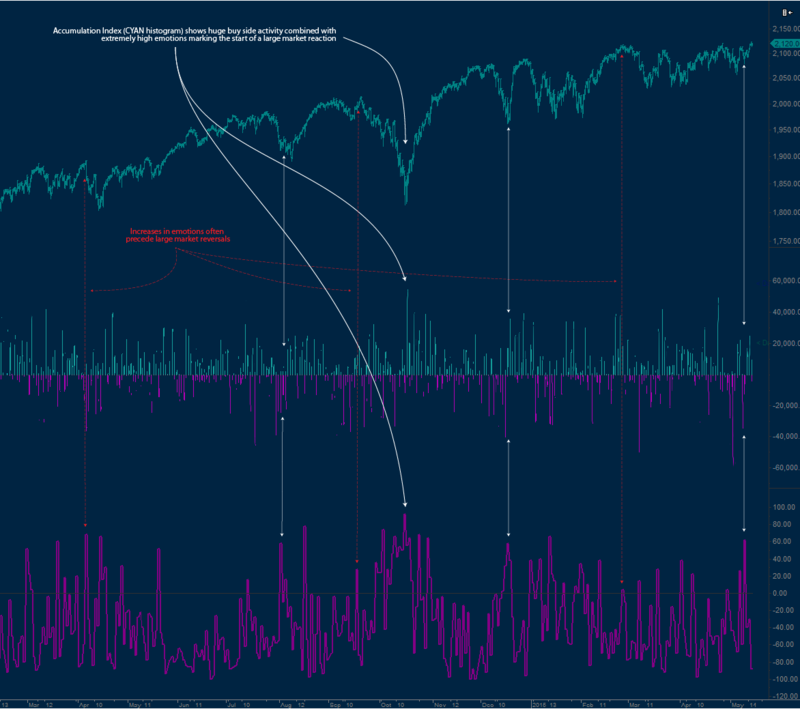 The Emotion index is unlike most any other similar analysis in that it actually measures market emotion in a foundational way and can, as a result show emotional capitulation near tops and bottoms - as opposed to VIX and Put/Call which simply react with measurable data to downside events - the eMotion index will generate extremes both at tops and at bottoms and show emotional conflict in the markets that otherwise mostly remains nearly invisible.